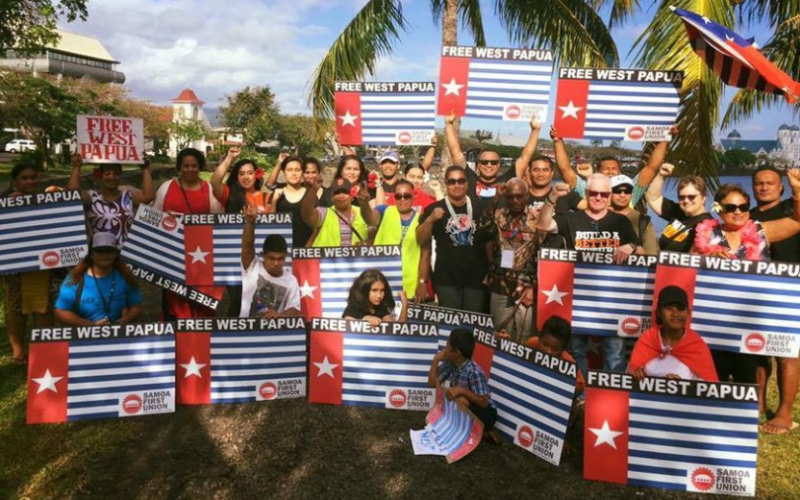 On the long road to independence the diplomatic efforts of the United Liberation Movement for West Papua (ULMWP) has positioned them to make some new political gains toward their ultimate goal of freeing West Papua. West Papua has never been closer to tipping the scales of justice in Melanesia than it is right now. The next twelve months are a crucial time to solicit vital support for West Papua’s right to self-determination at the next United Nations General Assembly. The time for Pacific Nations to take a public stand has come. This week the leaders who comprise the Pacific Islands Forum (PIF) will gather on Nauru to discuss Pacific regionalism. The official slogan for the meeting is “Building a Strong Pacific: Our People, Our Islands, Our Will.” Time will soon tell if Pacific solidarity is a true value of the people or just another elusive talking point of modern leadership. The forum’s 2018 agenda will include discussions on regional security, environmental security, and climate change. The case of West Papua is one of the most relevant examples of what can happen when there is a lack of regional solidarity and focus. In Melanesia regional security is threatened by the bullying presence of Indonesia, which is a Southeast Asian country steadily asserting their financial influence across the entire Pacific. One of the strongest allies to engage the forum about West Papua is the Pacific Islands Association of Non-Governmental Organizations (PIANGO). PIANGO’s leadership network was an integral partner in the formation of the United Liberation Movement for West Papua. For several years in a row PIANGO has made numerous efforts to encourage forum members to include the issues of decolonization and human rights violations in West Papua to meeting agendas. They have also pushed for the ULMWP to be given their proper seat at the Pacific table as full members of the Pacific Islands Forum and the Melanesian Spearhead Group. Vanuatu is also leading Pacific nations as a stellar example of Pacific solidarity by committing to address West Papuan self-determination at the United Nations. During a meeting in Samoa last month, Vanuatu’s Foreign Minister, Ralph Regenvanu, announced he was intending to submit a resolution calling for West Papua to be inscribed on the United Nations decolonization list during the UN’s General Assembly. He also reaffirmed that Vanuatu Prime Minister; Charlot Salwai will formally present a draft of their resolution to the Pacific Islands Forum during the summit on Nauru. Several Pacific nations remain on the United Nation’s list of non-self-governing territories. The inconvenient truth of decolonization has well faded from international dialogue and meeting agendas, but Vanuatu is taking a bold stand for West Papua to be put back on the decolonization list and to be given the internationally supervised vote on independence denied to their fellow Melanesian neighbors for over 56 years. In both Papua New Guinea and Fiji support for West Papua still hangs in the balance. This week Fijiian Leader of the Opposition Ro Teimumu Kepa fiercely called out Prime Minister Frank Voreqe Bainimarama over the inconsistencies between his calls for Melanesian solidarity and lack of action on behalf of West Papua. In her public statement she said “They have stabbed the indigenous Melanesian people of West Papua in the back by refusing to support their quest to be released from the colonial control of their homeland by Indonesia. Their behaviour towards the oppressed West Papuans is shameful. Due to Indonesia’s capacity to disrupt foreign trade and assert military might in the region many Pacific leaders have lost sight of the responsibility they have to the people they are supposed to serve. At this critical juncture it is the duty of all Pacific citizens to remind their representatives who’s voice should be lifted on international stages when life and death decisions are being made in their name. On every island across Oceania politicians often pay lip service to regionalism and pacific solidarity. The power of the Pacific lies within its greatest natural resource, its people. It is time for advocates across the Pacific to hold their leaders accountable for their position, or lack of one, on West Papua.